The mission of Equal Justice Works is to create a just society by mobilizing the next generation of lawyers committed to equal justice. 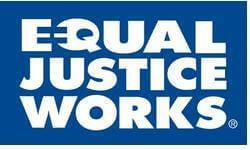 Equal Justice Works is the nation's largest provider of public interest opportunities for law students and lawyers. The organization's mission is to mobilizing the next generation of lawyers to serve the economically disadvantaged. Equal Justice Works deploys lawyers and law students across the country to address a range of legal issues facing veterans, natural disaster victims, people with barriers to employment, and unaccompanied children, among others. Equal Justice Works has tested systems and structures to deploy highly qualified new lawyers to top-notch host sites to address the nation's evolving needs in a cost-effective manner, having spent over two decade developing its Fellowship program and enhancing the work of our partner legal aid organizations. •	Experience running high-quality public interest fellowship programs. Since 1992, Equal Justice Works has run what is now the nation’s largest post-graduate public interest fellowship program for lawyers, having placed approximately 1,500 new lawyers in hundreds of nonprofit organizations nationwide. •	Over twenty years of experience administering and overseeing attorney fellowships and summer law student internships. •	Approximately eighty percent of our Fellows remain in public service after completing their Fellowships. •	Proven track record of selecting impressive candidates who go on to have meaningful impact throughout their careers. Our alumni include White House staffers, executive directors of multi-million dollar nonprofit organizations, an architect of the gay marriage litigation strategy, and the first Secretary of Tribal Relations in South Dakota. •	Proven ability to select projects that address clear needs in a compelling manner, leading to sustainability beyond the Fellowship project. Many Equal Justice Works projects started by Fellows exist up to twenty years later including “Have Justice, Will Travel” for domestic violence victims in Vermont, the D.C. Employment Justice Center, and the “Justice Bus” initiative in California that has been replicated in New York. •	Strong relationships with approximately 197 law schools and law school member-affiliated student organizations. •	Over twenty years of experience managing federal funds through the Corporation for National and Community Service and the U.S. Department of Justice. •	Ability to connect with an extensive alumni network from our Fellowship programs. •	Strong relationships with the law firm, corporate, and nonprofit legal communities.